Denosumab is also used to treat bone loss in women who are at high risk for bone fracture while receiving certain treatments for breast cancer. Denosumab is also used to treat bone loss in men who are at high risk of bone fracture while receiving certain treatments for prostate cancer that has not spread to other parts of the body. This medication works by slowing bone loss to help maintain strong bones and reduce the risk of broken bones (fractures). Denosumab belongs to a class of drugs called monoclonal antibodies. It prevents certain cells in the body (osteoclasts) from breaking down bone. Read the Medication Guide provided by your pharmacist before you start using denosumab and before each injection. If you have any questions, ask your doctor or pharmacist. Your healthcare provider will inject this medication under your skin in the upper arm, upper thigh, or abdomen as directed by your doctor, usually every 6 months. Take calcium and vitamin D as directed by your doctor, usually 1000 milligrams of calcium and at least 400 IU of vitamin D daily. Use this medication regularly in order to get the most benefit from it. It is important to keep receiving this medication even if you feel well. Most people with osteoporosis do not have symptoms. Remember to receive it every 6 months. It may help to mark your calendar with a reminder. What conditions does Prolia Syringe treat? Denosumab may cause low calcium levels, especially if you have kidney problems. Take calcium and vitamin D as directed by your doctor. (See also How to Use section.) Your doctor will order calcium blood tests before your first injection and during treatment. Tell your doctor right away if you have any symptoms of low calcium such as: muscle spasms/cramps, mental/mood changes (such as irritability or confusion), numbness/tingling (especially around lips/mouth or in fingers/toes), fast/irregular heartbeat, severe dizziness/fainting, seizures. Tell your doctor right away if you have any serious side effects, including: jaw pain, new or unusual thigh/hip/groin pain, bone/joint/muscle pain. After your treatment with denosumab is stopped, you may be at increased risk for bone fracture, including bones in your spine. Do not stop using this medication without first talking with your doctor. If your treatment is stopped, talk with your doctor about other medicines you can take. List Prolia Syringe side effects by likelihood and severity. Before using denosumab, tell your doctor or pharmacist if you are allergic to it; or if you have any other allergies. This product may contain inactive ingredients (such as latex), which can cause allergic reactions or other problems. Talk to your pharmacist for more details. Before using this medication, tell your doctor or pharmacist your medical history, especially of: low blood calcium levels (hypocalcemia), thyroid/parathyroid problems/surgery, stomach/intestinal problems (such as malabsorption, surgery), kidney problems, recent or planned dental surgery/tooth removal. Denosumab is not recommended for use in children. It may slow down a child's growth and affect tooth development. What should I know regarding pregnancy, nursing and administering Prolia Syringe to children or the elderly? Lifestyle changes that help promote healthy bones include increasing weight-bearing exercise, stopping smoking, limiting alcohol, and eating well-balanced meals that contain adequate calcium and vitamin D. Since you may also need to take calcium and vitamin D supplements and make other lifestyle changes, consult your doctor for specific advice. Laboratory and/or medical tests (such as bone density tests, calcium/phosphorus/magnesium levels, kidney function) should be performed periodically to monitor your progress or check for side effects. Consult your doctor for more details. This medication is given in a hospital or clinic or doctor's office and usually will not be stored at home. If you are picking up this medication at the pharmacy to bring to your medical appointment, store in the refrigerator between 36-46 degrees F (2-8 degrees C) until the day of your appointment. Keep all medications away from children and pets. If you have any questions about storage, ask your pharmacist. Do not flush medications down the toilet or pour them into a drain unless instructed to do so. Properly discard this product when it is expired or no longer needed. Consult your pharmacist or local waste disposal company for more details about how to safely discard your medication.Information last revised June 2017. Copyright(c) 2017 First Databank, Inc.
Are you taking Prolia Syringe? Are you considering switching to Prolia Syringe? 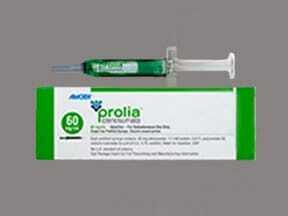 How long have you been taking Prolia Syringe?